is a prominent Tunisian journalist who has been in the field since 1997. 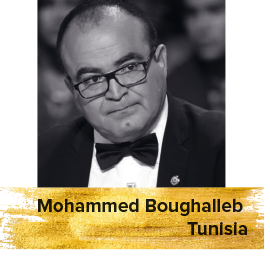 Following the 2011 revolution in Tunisia, Boughalleb turned to the television airwaves as a political analyst to commentate on the tumultuous current affairs back then. Boughalleb writes about cinema for different online platforms and prestigious publications. He has also participated in several film festivals including Cannes, Dubai International Film Festival, Cairo International Film Festival and the Abu Dhabi Film Festival.